Let's take a brief look at Futures End #48, since it is actually important for a comic tomorrow. One of the traditions of Marvel annuals (and DC annuals, but that's for another day) is introducing new characters who then fall down the memory hole. If they're lucky, perhaps they might show up in a crowd scene, and if unlucky, as a kill for some new villain the creators are trying to give a "push." Please pardon the image, the cover of my copy is in terrible shape. Eight pages of twenty-five from the first story in Amazing Spider-Man Annual #27. 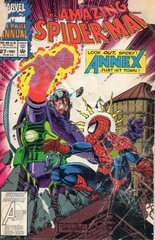 The issue is filled out with a Black Cat/Solo team-up, the trial of the Lizard, and a John Jameson adventure, finishing off with a Maximum Carnage cover gallery. Let me know if you want to see any of those. Comicbookresources has the whole 5 page preview up on the site. ogrebear just posted the cover so I was highly amused when I saw the contents of this issue which is the Academy's "School Dance"
The Bloodlines conclude with this annual! We head back to L.E.G.I.O.N (they're the folks who first investigated the Parasite ship in the Lobo Annual via sending Lob and Layla to find out what was up). So...just where did these Parasites come from anyway? 18 pages of a 55 page story.